HDFC Click 2 Protect is popular online term insurance plan. Good Claim settlement ratio, economical premium charges and trustable brand image make this product more attractive. It is advisable to go through this plan before buying any online term insurance policy. This plan is now extended with new version called as HDFC click 2 protect plus. HDFC Click 2 Protect plus provides add-on optional features compare to traditional plan. Apart from this HDFC Click 2 Protect plus can be purchased offline. Let’s review this plan in detail. 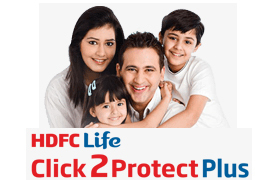 HDFC Life Click 2 Protect Plus is non-participating traditional term plan. This plan can be customized with four different options. Life Option – Lump sum payout on Death. This is good old option, which gives your family the assured sum as a lump sum amount. Under life option you have facility to increase life cover on certain key milestones of your life like Marriage, Child Birth without fresh medical test. Say At age of 30 years you purchased this policy with life cover of Rs 1Cr, with increase in responsibility like marriage if you wish to increase life coverage by 50% you can do that. After birth of first child you can increase coverage by 25% more. Extra Life Option (Accidental Death Benefit) –Extra life option covering accident death benefit which gives your family double the assured sum. Income Option –Part of Sum Assured payable on death and the remaining payable as monthly income for 15 years. Say for life cover of Rs 1Cr in case of demise of the policy holder family will get Rs 10 lac in lump sum and remaining Rs 90 lac will be divided into monthly instalment of Rs 50000/- and be paid monthly for next 15 years. Income Plus Option – Sum Assured paid on death & monthly income paid for next 10 years. The monthly Income can be chosen as Level or increasing at 10% p.a. Say for life cover of Rs 1Cr in case of demise of the policy holder family will get Rs 1Cr as lump sum plus monthly income of Rs 50000/- for 10 years or Rs 50000/- per month increasing at 10% p.a. The premium quotes below are of a regular policy for a healthy non smoker male for a Sum assured of Rs 1 Cr. Term of the policy is 25 years. No benefit is payable on survival till end of policy term. In case of death due to suicide, within 12 months from the date of inception of the policy, the nominee of the policyholder shall be entitled to 80% of the premiums paid. In case of death due to suicide within 12 months from the date of revival of the policy, the nominee of the policyholder shall be entitled to 80% of the premiums paid post revival. HDFC Click 2 Protect Plus – Should you Buy? HDFC Click 2 Protect plus is very good plan which provide flexibility in terms of coverage with multiple options but as per me you must consider only life option of HDFC Click 2 Protect Plus. It is not advisable to opt for any additional option like Income or Income plus option. In Income option insurance company will keep 90% of sum assured with them and distribute that in monthly installment without any additional interest. Instead of this simple life option will provide 100% amount which can be invested in Fixed Deposit or MIS to earn better income. Similarly for Income plus option you have to pay additional premium you can use this additional premium amount for investment in other option to get better return. So from my end it is YES for HDFC Click 2 Protect Plus but with Traditional LIFE option only. To get more information about this policy click here. I bought HDFC click to protect policy two year back,(2013) still i am continuing, my question is, I am working in singapore, If any thing happence at out side of the india, claim is applicable or not. because i opened policy when i am working in india, now i am working in outside india. I am quite doubtful on that. It will depends on terms and condition of HDFC Click2protect. However i feel that it will not be applicable. What is the medical tests required for the sum assured of 1 crore. Medical Test is standard in case of Term Insurance HDFC Click 2 Protect. Thanks for Step by step information. are these valid only for Extra Life Option or that exclusions valid also for Life option too ? As per details available soon HDFC will discontinue old plan Click 2 Protect. As of today it is not possible to migrate but in future they may allow this. Even i have same question.. i just now purchased the click2protect but they said you cannot change the policy now to click2protect plus. Thanks for sharing your articles, I want to buy a Online Term plan 75 Lacs (Non-Somker). I had gone through website but there are some points which are not clear to me, please reply me so i could take discussion fast. a) If a person is died in natural disasters, Terrorist attacks, accident (any type) or murder? b) If a person is died due to some critical illness like cancer, lever failure etc ? c) If a person died outside India then claim is applicable or not? Quest 2) For how many sum assured value we have to go for medical test ? Whether all these are included in it or not, please specify. Comparing to LIC eTerm this plan is cheaper & had more flexibility. An Accident is a sudden, unforeseen and involuntary event caused by external, visible and violent means. Accidental Death means death by or due to a bodily injury caused by an Accident, independent of all other causes of death. Accidsental Death must be caused within 180 days of any bodily injury. shall be entitled to 80% of the premiums paid post revival. We will not pay accidental death benefit if the death occurs after 180 days from the date of the accident. Not enough information found about if person died outside India. A life cover of 75 lakhs without the hassles of a medical test for age less than 40(Company reserves the right to call for medical tests based on information submitted and subsequent under writing assessment). Thanks for your input its was realy very helpful.